Delf boy heads on Delf girl bodies - too big? I have seen so many beautiful Delf boys out there that I believe would make absolutely gorgeous girls, and I really love the Luts Delf girl bodies - both the large and smaller busted varieties. 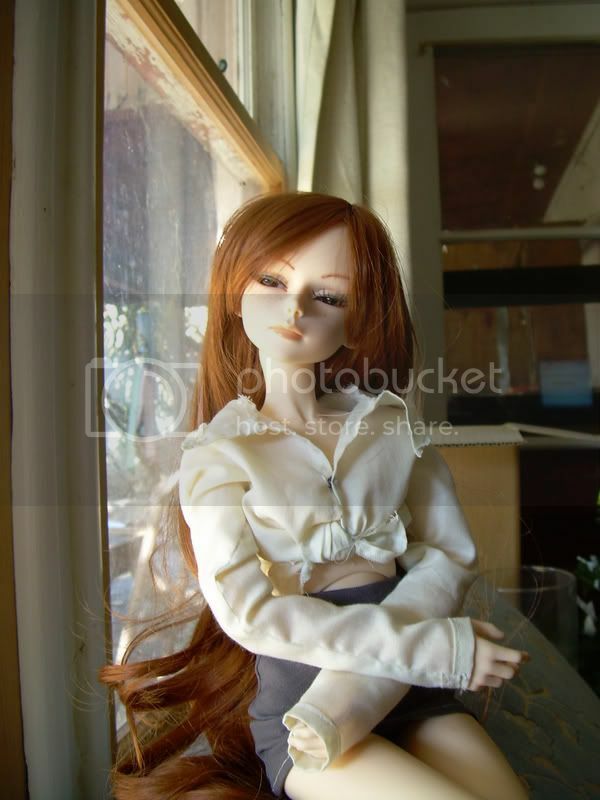 However, I worry that the boy heads might look too big on the Luts Delf girl bodies. The few pictures of delf boys as girls I have found are not giving me a definitive answer one way or the other. What is everyone elses opinion? Are Delf boy heads too big for delf girls or not? Am I in danger of creating Luts Resin Pullips? It depends on the head. Shiwoo and El's head is a lot larger than Yder's, for example, so I'd be less hesitant to put a Yder's head on a girl body. Type 2 heads also tend to be smaller than type 1 heads... especially if the type 1 is older or the type 2 is from that wacky period around Christmas '07 when the Nanuri '07 was released. It's been done and oftentimes well, though. Off the top of my head I can think of a couple of examples--byouyuuken has a really cute Dambi girl, and PaulinePol has a pretty Yder girl. Darkmothflame has an El on a female body. Yes, the neck is much thinner. Even when Luts went to a universal sizing for the attachment point, they didn't widen the entire girl neck, but flared it out at the top only. Yder's look nice on the CP girl body. That Nanuri 07 gift head now...I haven't found a body yet that fits that! Haven't gotten a CP girl I could try it with, but was really hoping for a boy body. Thanks Amet and hobbywhelmed. Your info is very helpful. You have directed me to some great examples - I particularly like PaulinePol's Yder girl. If anyone else out there has opinions or examples of Delf boys on Delf girl bodies I would love to hear about them too. I was looking for a topic like this. Does anyone know well a Mill head would fit & look on a girl body? Isn't Mill a Kid Delf? Are you wondering if he'd fit on a 60cm Delf girl body? I'm pretty sure a Mill head would be way to little and have too small of a neck opening to fit on a Delf girl body. Or are you wondering if he'd work as a female Kid Delf? If you want to know about Kid Delf gender/body swapping you should ask in the Mini Discussion sub-forum. I have a female Shiwoo. It's a type 2 shiwoo on a type 2 girl body. I don't think it looks bad at all. Thanks vampireanneke and Raouken! Both your Delf girls look wonderful. I am really appreciating the advice and the examples from everyone. ***BIG HUGS*** to you all! The boy body that B&G sells fits the smaller Luts heads. I have the same problem. I love some of the newer sculpts, but the heads are so small. Even the new type 3 bodies are still too big for those tiny heads. : :: Perhaps you should try that though. Would a Soo Special head fit on a delf boy body?